Camping that’s fit for a king! Welcome to Europe's finest open-air hotels ! For your next family holiday, why not rent a mobile home in the loveliest regions of France, Spain or Portugal? Yelloh! Village looks forward to seeing you in the most beautiful regions of these 3 countries, which have all the qualities needed for an amazing stay. Come and stay in one of our countryside campsites, find out about the local heritage and get off the beaten track! Enjoy a relaxing break in an authentic environment. You'll be able to enjoy wellness in the mornings, bathing in the afternoons and fun & festivities in the evenings. So come and enjoy the wide range of our fun options and the comfort of our facilities! Campsites with water slides Discover our campsites with water slides! Premium Accommodation Landscaped, pedestrian areas, elegant interior decoration, premium equipment and services included! Follow the Yelloh! Village news ! Whatever type of holiday you're looking to enjoy with your family or friends, Yelloh! Village has the answer. Make the most of the fun of the water when you come and stay by the Mediterranean or on the Atlantic coast. And you also have the choice of sleeping beside a lake or a river! If you're looking to recharge those batteries right up close to nature, then you can choose our campsites in the countryside, or in the mountains, where you'll really appreciate the benefits of staying somewhere up high. Your children will be able to make the most of all the facilities provided by Yelloh! Village, including the aquatic parks with waterslides and the kids clubs for all age groups. Our 4 clubs will be here to make sure your children enjoy a truly unforgettable holiday. Depending on your needs, you'll find campsites with babies clubs for children up to the age of 4, kids clubs for 5 to 7 year olds, juniors clubs for 8 to 12 year olds and teens clubs for 13 to 17 year olds. Parents haven't been forgotten either, thanks to our activity leaders who will be organising sports activities for you throughout the day, along with entertainment in the evening. You'll be able to relax, whatever the weather, in our aquatic parks with covered and heated swimming pools, or chill out in a spa. With our wide range of rental options (mobile homes, furnished tents, cottages, tree cabins, chalets, gypsy caravans etc.) 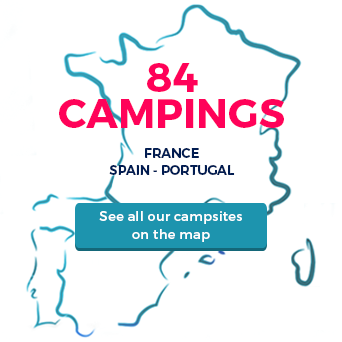 come and discover - or rediscover - the delights of camping for your next stay. You'll be able to make the most of the upmarket services in our 3, 4 and 5 star establishments. Customer satisfaction is what drives us, which is why our villages are subject to a quality charter made up of more than 500 points, which are inspected every year.